Throughout the 20th century, great painters have been employed to design sets and costumes, with varying degrees of success. Among the most successful is David Hockney (born 1937), whose bold sense of form and colour are admirably suited to the stage. His ability to absorb a subject and then embody it visually using only the essential elements gives a great simplicity to his stage pictures, creating the essence of a character, theme or period. Bag inscribed: 'D1 LEFANT & ROSS' and painted with an arrow and 'GAUZE'. Underneath that 'E8' changed to 'E9 SEA SILK'. 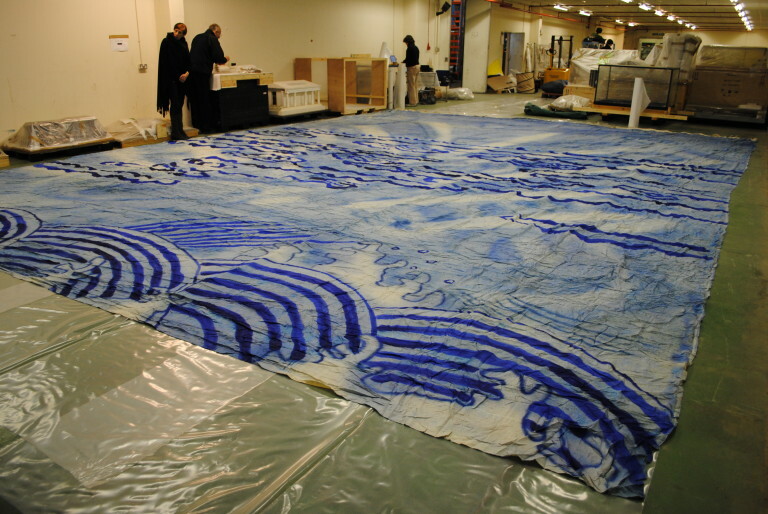 Cloth used as part of the staging for Le Rossignol (The Nightingale) and L'Enfant et les Sortilèges (The Child and the Spells), Royal Opera House, Covent Garden, 1983. Stage cloth designed by David Hockney for a double bill of Stravinsky's opera Le Rossignol and Ravel's opera L'Enfant et les Sortilèges, Royal Opera House, Covent Garden, 1983. 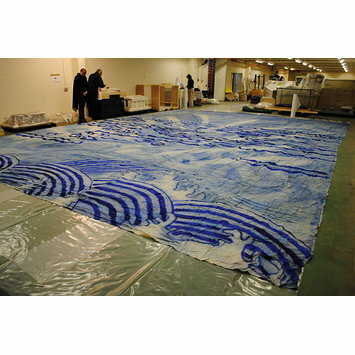 Painted silk cloth.